The Global Fund has embarked on a process that could see major changes made to the role and structure of country coordinating mechanisms (CCMs). A key part of the process is a series of regional consultations which the Global Fund’s CCM Hub is organizing together with several of the Fund’s partners, including GIZ BACKUP Health, the International HIV/AIDS Alliance and Initiative 5%. BACKUP Health is participating on behalf of the German Federal Ministry for Economic Cooperation and Development and the Swiss Agency for Development and Cooperation. At its meeting in November 2016 in Geneva, Switzerland, the Board discussed a report prepared by the Secretariat on the Global Fund’s business model. The report concluded that there are strong advantages to the Global Fund’s current business model but that improvement should be made in three areas, one of which was strengthening CCMs. The report noted that many of the key challenges CCMs face were identified in an OIG audit of CCMs, on which a report was released in February 2016. These challenges were as follows: insufficient CCM involvement in oversight of grants; variable engagement and empowerment of civil society and key populations on CCMs; and inappropriate linkages with key actors in-country. To address the report’s recommendation that CCMs be strengthened, the Global Fund initially decided to develop a “CCM Strategy.” The strategy was subsequently re-named the “CCM Evolution Project.” The goal of the project is to evolve CCMs to achieve greater impact. Eight CCMs have been invited to the consultation in Siem Reap: Thailand, Philippines, Cambodia, Bhutan, Papua New Guinea, Sri Lanka, Timor Leste and Kazakhstan. The preliminary agenda for the consultation in Siem Reap calls for discussion on how CCMs could evolve in the following four areas: (1) functioning and CCM secretariat; (2) composition and engagement (3) national programs coordination and linkages; and (4) oversight. The agenda also includes a discussion of differentiation as it could apply to CCMs. This refers to the notion that there should be different models of CCM structure and functioning, depending on the context. For example, there could one model for CCMs in challenging operating environments, another model for CCMs in high impact countries, etc. Fifteen CCMs are being invited to the consultation in Addis Ababa: Ethiopia, Kenya, Lesotho, Liberia, Malawi, Namibia, Nigeria, Rwanda, Sierra Leone, Sudan, Tanzania, The Gambia, Uganda, Zambia and Afghanistan. CCMs are being asked to send a three-person delegation: one representative from the Government; one member of the CCM’s oversight committee; and one person from either civil society or key populations. The letter of invitation to the Addis Ababa consultation states that the first two days will be devoted to a review of the current CCM model and that participants will be asked to “develop, discuss, and recommend concrete steps and actions to be implemented in 2018 and beyond.” The second two days will provide a platform for learning exchange, especially on CCM governance, and on the CCM eligibility requirements related to oversight and the engagement of civil society and key populations. The letter said that CCMs will have the opportunity to present good practices and challenges in these areas and to discuss approaches to improve CCM performance. What do you see as the top three issues and advantages of your current CCM model? How could the CCMs best address the issues and build on the advantages? In light of the new Global Fund Strategy, what are the top one or two ways in which CCMs can evolve? Based on the country context (conflict, size…), should the CCMs have different responsibilities and characteristics? Eleven CCMs are being invited to the regional consultation in Ukraine: Albania, Bosnia & Hercegovina, Bulgaria, Iran, Kazakhstan, Macedonia, Moldova, Montenegro, Romania, Tajikistan and Ukraine. Twenty-one CCMs have been invited to the regional consultation in Abidjan: Benin, Burkina-Faso, Burundi, Cameroon, C.A.R., Chad, Comoros, Côte d’Ivoire, Djibouti, DR Congo, Gabon, Guinea-Conakry, Madagascar, Mali, Morocco, Mauritania, Niger, Republic of Congo, Sénégal, Togo and Tunisia. The letter of invitation for the Abidjan consultation is similar to the one for Addis Ababa. One difference concerns the agenda for the last two days of the consultation. For the Abidjan consultation, CCM members and other stakeholders who are interested are being asked to reflect on how technical assistance – and, in particular, the 5% Initiative – can play a role in CCM evolution. The objective of this part of the agenda is to review the contributions of the 5% Initiative, to share best practices, and to define new approaches in the context of CCM evolution. Ten CCMs are being invited to the LAC consultation meeting: Panama, El Salvador, Belize, Surinam, Jamaica, Paraguay, Cuba, Dominican Republic, Honduras and Guatemala. The Secretariat told Aidspan that it will give all “non-attending CCMs” a questionnaire to provide feedback on CCM challenges, solutions, and ways to evolve the CCM model. Following the consultations, the Secretariat will prepare a proposal for revamping the role and structure of CCMs. The proposal will be discussed and refined by the Strategy Committee and the Ethics and Governance Committee, and the Board will be asked to approve the proposal at its meeting in May 2018. Guidance documents and training materials will also need to be prepared. Aidspan understands that some Board delegations have expressed a concern that the consultations process is too rushed. GFO should be in a position to report in more depth on the CCM Evolution Project after some of the regional consultations have taken place. To guide the discussions on CCM evolution, the Secretariat has prepared an update on the size and structure of CCMs; CCM performance; and the factors that influence CCM performance and grant performance. The following is a summary. The size of CCMs ranges from five members to 39 members. On average, civil society representatives make up about 50% of the total membership, which is 10 percentage points more than the minimum set by the CCM eligibility requirements. The majority of CCMs are chaired by a government official. Total funding for CCMs has remained relatively steady in the last four years, ranging between $8.2 million and $9.2 million annually. On average, CCMs receive $90,000 a year. Over that same period, total funding for regional coordinating mechanisms (RCMs) has increased significantly, from $0.2 million in 2013 to $1.8 million in 2016. On average, RCMs receive $180,000 a year. While the number of CCMs is relatively finite, the number of RCMs is largely determined by the initiatives in place to fund multi-country approaches. 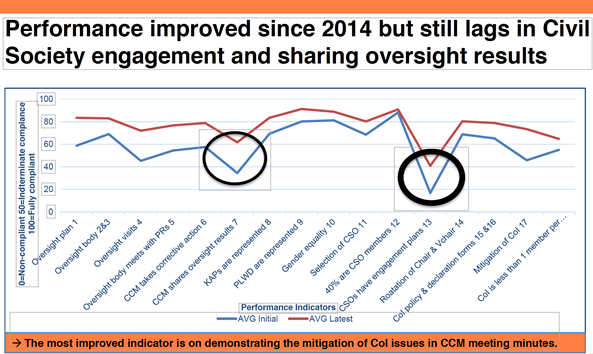 Performance has improved since 2014 but still lags in two areas: sharing oversight results (Indicator 7) and civil society engagement (Indicator 13) (see figure). Indicator 7 measures whether CCMs are sharing oversight results with the Global Fund Secretariat and in-country stakeholders on a quarterly basis. Indicator 13 measures whether the CCM has a clearly defined process for members to solicit input from, and provide feedback to, their constituents. High impact CCMs do better due to increased partner engagement. Fourteen CCMs and one RCM account for most of the low-performing coordinating mechanisms. Not surprisingly, there is a strong correlation between low-performing CCMs and challenging operating environments. Based on an analysis, the Secretariat found that stronger CCM performance is correlated with several factors the Global Fund can influence – i.e. the amount of CCM funding, turnover of CCM members and size of the CCM. The analysis also revealed that CCM performance has a small but positive correlation with grant performance.